Spring is finally here! It's been a long, cold, windy, snowy winter, and boy am I glad that it's over. Maybe it's because I lived in Pittsburgh for 8 years of my life (and Korea before then), where we were pummeled with a foot of snow each winter, but I have a strong aversion to the cold. Even though I have an enormous eskimo-worthy jacket to trek through any snowstorm, I just feel like the snow and cold weather slow me down when I'm trying to get somewhere and make me want to hibernate at home. Even though I've never lived in California (I've only visited for a week when I was in high school), I honestly feel like I'm a Cali person at heart! I just feel like the food and the weather there are incredible, and what's not to like about warm weather and sunshine? The only thing that makes me a bit apprehensive are the earthquakes, but supposedly Cali people just shrug their shoulders at them and move on with their day. Hopefully I'll be able to live in Cali for at least a part of my life. Anyways, this is a hearty and comforting dish that I like to make on cold, wintery days, or even during rainy days when I just feel like staying in and am craving something hearty. Yes, it's a bit labor intensive, but once you have tried it a few times, this recipe will become a cinch to make! This dish is also visually appealing and impressive, perfect to serve at a dinner party! You can make the curry according to the chicken curry recipe I previously uploaded [here]. If I make a huge batch of curry, I like to reserve some of the sauce and set it aside so I can re-heat it and enjoy it with the tonkatsu. If multi-tasking stresses you out, then I would suggest making the curry ahead of time. If you're making the curry just to serve with the tonkatsu, you can make the more simplified version below. While the curry is simmering, you can work on the tonkatsu! 1. Cut the onions into wedges. Peel and cut the carrot into bite size chunks (I used the Rangiri/ rolling wedges method; Make a diagonal cut, make a quarter turn, and make another cut; the carrots will be of a pyramidal shape. Refer to this [link] for more detailed instructions). Mince the ginger. 2. Heat the oil in a large pot over medium heat, and add the onions. Sauté for a few minutes until the onions become translucent (about 3-4 minutes). 3. Add the ginger and garlic. Give the pot a good stir. Add the carrots and stir. Add the water to the pot, and bring to a boil. 4. Add the honey and salt to the pot, and simmer on medium heat for 20 minutes, uncovered (start working on the tonkatsu here). 5. Remove the pot from heat, and add the curry roux, 1 block at a time. After adding each block, stir well to make sure that it is completely dissolved. 6. Add the soy sauce and ketchup (and tonkatsu sauce and/or Worcestershire sauce if you wish). Simmer on low heat, uncovered, stirring frequently, until the curry thickens. Now for the tonkatsu recipe! 1. Cut away the excess fat and make several slits around the area where you just cut off the fat. 2. Cover the pork with plastic wrap, and pound with a meat tenderizer or mallet to desired thickness. Season with salt and pepper on both sides. 3. In a plate, whisk the eggs and the oil together. 4. Set up your breading station- place the flour in one plate and the breadcrumbs in another plate. First dip the pork in flour; make sure that all of the pork is covered and shake off the excess flour. Dip the pork in the egg mixture. Lastly, coat the pork with the panko breadcrumbs. After shaking off the excess panko, press gently on both sides of the pork to ensure that the breadcrumbs are well adhered. 5. Line a plate with paper towels. Heat oil in a wok or a deep, heavy skillet. You want about an inch to 1.5 inch of depth; wait until the oil reaches about 350F. You may use a thermometer, or dip the back of a wooden spoon into the oil. When bubbles appear around the spoon, then you know the oil is hot enough! Using chopsticks or tongs, gently lower the pork into the oil; you want to be gentle so that the breading does not come off. 6. Fry the pork for 1 minute on one side, then flip over and fry the other side for 1 minute. My chop was about 3/4 inch in thickness, so if your pork is thinner, reduce the frying time. 7. Lift the tonkatsu from the oil and gently let the excess oil drip off. Transfer the pork to a paper towel-lined plate and let sit for 4 minutes. 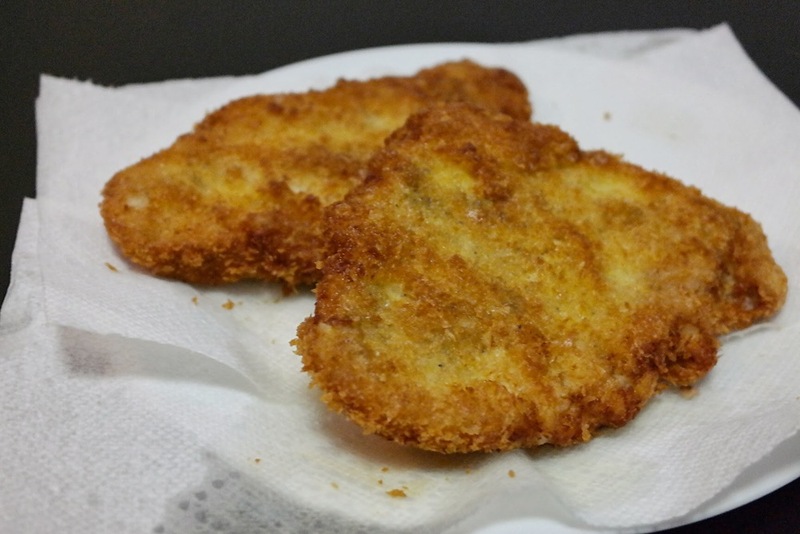 While the first tonkatsu is resting, you can fry the second one. If there is breading floating in the skillet, then gently lift them out, as they will burn. 8. Transfer the once-fried tonkatsu back to the skillet, and fry for about 30 seconds on each side. Transfer again to the plate and try to let it rest vertically to keep the tonkatsu from becoming soggy. If you poke the tonkatsu with chopsticks, and the liquid is clear, then you know that the pork is done. 9. After 2 minutes of resting, cut the tonkatsu into 3 pieces. Instead of dragging your knife back and forth, press down firmly on the knife to ensure that the tonkatsu cuts cleanly without the breading coming off. Cut again into smaller slices of desired width. Enjoy! You may serve the tonkatsu by itself, or with the curry sauce (and a soft-boiled egg and pickled gingers)!